Welcome to the fifth (and final) Circle of fifths lesson. Below are detailed steps to understand and draw the minor flat scale names on the Circle of fifths diagram. Please read the first four lessons before continuing, as they are meant to be read in sequence. This step shows how to memorize and draw the minor flat scale labels on the Circle of fifths diagram. In 3. Minor sharps, all minor scale labels were drawn in, except for 3 labels. And in 4. Major flats, all major flat scales labels were drawn in using the Battle Ends And Down Goes Charles Father phrase. To work out the final 3 minor scale labels, this phrase will be re-used again starting at 7 o'clock on the outer spiral arm, moving counter-clockwise. Draw in Battle, Ends, and And at at 7, 6 and 5 o'clock on the outer spiral arm. Since we are dealing with flats, all of these labels should have a flat sign afterwards. (All minor flat notes are shown in highlighted green, lower case text, in the diagram). The remaining steps below take each minor scale in turn, showing key signature and relationship to the relative major in each case, starting with the minor scale with the fewest flats - D natural minor scale at 11 o'clock. The 4th note interval of each scale will be used to identify the next minor scale with an extra flat note moving counter-clockwise until the end of the spiral - Ab natural minor scale, which has 7 flats at 5 o'clock. This step shows the musical relationships between the D minor scale and F major scale on the Circle of 5ths diagram. Starting at 11 o'clock, with the D natural minor scale, this scale has 1 flat. Looking across from the green minor scale label to the red major scale label, the relative major of this scale is F major scale. Having already drawn in the relative major - F major on circle of 5ths, which has the same note names, we know that the extra flat needed for this step is Bb. From the table below, the 3rd note in this minor scale is note F, which is the tonic (starting note) of the relative major ie. F major scale, which matches the red major note label next to it. 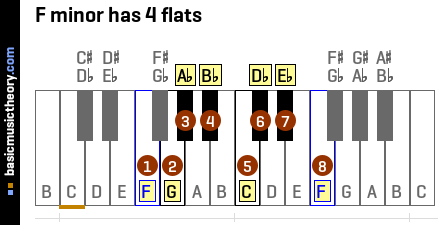 The 6th note in the F major scale is note D, which is the tonic note of this D natural minor scale, and the table below confirms that these relative scales contain the same note names, but start on different notes. For more details on this relationship for this specific key, have a look at the F relative minor. The treble clef for D minor - with 1 flat next to the treble clef, which is the same key signature as we saw in the previous lesson - F major on circle of 5ths. This key signature is complete and we will move counter-clockwise to the previous hour position. The next minor scale to consider is the 4th note of this minor scale, which the piano diagram below shows note G, so the next step will look at G natural minor scale. This step shows the musical relationships between the G minor scale and B-flat major scale on the Circle of 5ths diagram. Now we have moved counter-clockwise to the G natural minor scale, which has has 2 flats, which is 1 flat more than the previous step. Looking across from the green minor scale label to the red major scale label, the relative major of this scale is Bb major scale. Having already drawn in the relative major - Bb major on circle of 5ths, which has the same note names, we know that the extra flat needed for this step is Eb. From the table below, the 3rd note in this scale, note Bb, so the relative major of this scale is Bb major scale, which matches the red major note label. 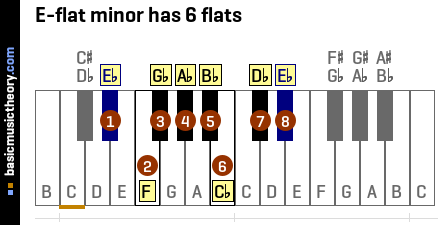 The 6th note in the Bb major scale is note G, which refers back to this minor scale - G natural minor scale, and the table below also confirms that these relative scales contain the same note names. 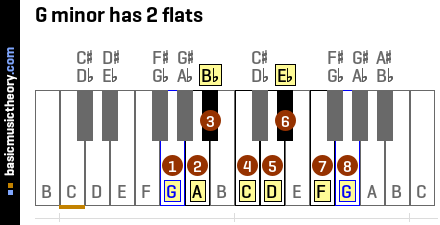 For more details on this relative key relationship for this specific key, have a look at the Bb relative minor. The treble clef for this scale has has 2 flats, which is the same key signature as the relative major we saw in the previous lesson - Bb major on circle of 5ths. The next minor scale to consider is the 4th note of this minor scale, which the piano diagram below shows note C, so the next step will look at C natural minor scale. This step shows the musical relationships between the C minor scale and E-flat major scale on the Circle of 5ths diagram. Now we have moved counter-clockwise to the C natural minor scale, which has has 3 flats, which is 1 flat more than the previous step. Looking across from the green minor scale label to the red major scale label, the relative major of this scale is Eb major scale. Having already drawn in the relative major - Eb major on circle of 5ths, which has the same note names, we know that the extra flat needed for this step is Ab. From the table below, the 3rd note in this scale, note Eb, so the relative major of this scale is Eb major scale, which matches the red major note label. The 6th note in the Eb major scale is note C, which refers back to this minor scale - C natural minor scale, and the table below also confirms that these relative scales contain the same note names. For more details on this relative key relationship for this specific key, have a look at the Eb relative minor. The treble clef for this scale has has 3 flats, which is the same key signature as the relative major we saw in the previous lesson - Eb major on circle of 5ths. The next minor scale to consider is the 4th note of this minor scale, which the piano diagram below shows note F, so the next step will look at F natural minor scale. This step shows the musical relationships between the F minor scale and A-flat major scale on the Circle of 5ths diagram. Now we have moved counter-clockwise to the F natural minor scale, which has has 4 flats, which is 1 flat more than the previous step. Looking across from the green minor scale label to the red major scale label, the relative major of this scale is Ab major scale. Having already drawn in the relative major - Ab major on circle of 5ths, which has the same note names, we know that the extra flat needed for this step is Db. From the table below, the 3rd note in this scale, note Ab, so the relative major of this scale is Ab major scale, which matches the red major note label. 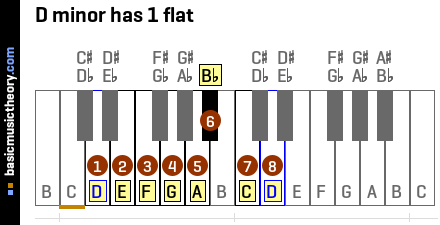 The 6th note in the Ab major scale is note F, which refers back to this minor scale - F natural minor scale, and the table below also confirms that these relative scales contain the same note names. For more details on this relative key relationship for this specific key, have a look at the Ab relative minor. The treble clef for this scale has has 4 flats, which is the same key signature as the relative major we saw in the previous lesson - Ab major on circle of 5ths. The next minor scale to consider is the 4th note of this minor scale, which the piano diagram below shows note Bb, so the next step will look at Bb natural minor scale. This step shows the musical relationships between the B-flat minor scale and D-flat major scale on the Circle of 5ths diagram. Now we have moved counter-clockwise to the Bb natural minor scale, which has has 5 flats, which is 1 flat more than the previous step. Looking across from the green minor scale label to the red major scale label, the relative major of this scale is Db major scale. Having already drawn in the relative major - Db major on circle of 5ths, which has the same note names, we know that the extra flat needed for this step is Gb. From the table below, the 3rd note in this scale, note Db, so the relative major of this scale is Db major scale, which matches the red major note label. 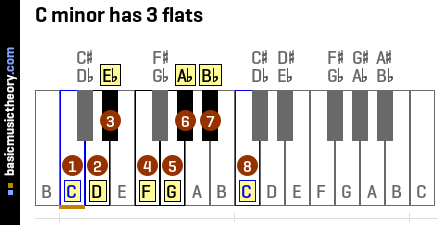 The 6th note in the Db major scale is note Bb, which refers back to this minor scale - Bb natural minor scale, and the table below also confirms that these relative scales contain the same note names. For more details on this relative key relationship for this specific key, have a look at the Db relative minor. The treble clef for this scale has has 5 flats, which is the same key signature as the relative major we saw in the previous lesson - Db major on circle of 5ths. The next minor scale to consider is the 4th note of this minor scale, which the piano diagram below shows note Eb, so the next step will look at Eb natural minor scale. This step shows the musical relationships between the E-flat minor scale and G-flat major scale on the Circle of 5ths diagram. Now we have moved counter-clockwise to the Eb natural minor scale, which has has 6 flats, which is 1 flat more than the previous step. Looking across from the green minor scale label to the red major scale label, the relative major of this scale is Gb major scale. Having already drawn in the relative major - Gb major on circle of 5ths, which has the same note names, we know that the extra flat needed for this step is Cb. From the table below, the 3rd note in this scale, note Gb, so the relative major of this scale is Gb major scale, which matches the red major note label. 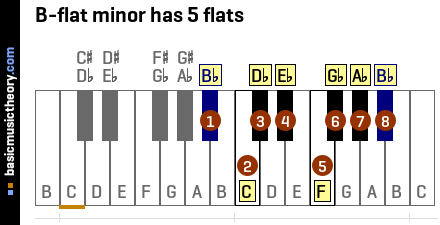 The 6th note in the Gb major scale is note Eb, which refers back to this minor scale - Eb natural minor scale, and the table below also confirms that these relative scales contain the same note names. For more details on this relative key relationship for this specific key, have a look at the Gb relative minor. The treble clef for this scale has has 6 flats, which is the same key signature as the relative major we saw in the previous lesson - Gb major on circle of 5ths. The next minor scale to consider is the 4th note of this minor scale, which the piano diagram below shows note Ab, so the next step will look at Ab natural minor scale. 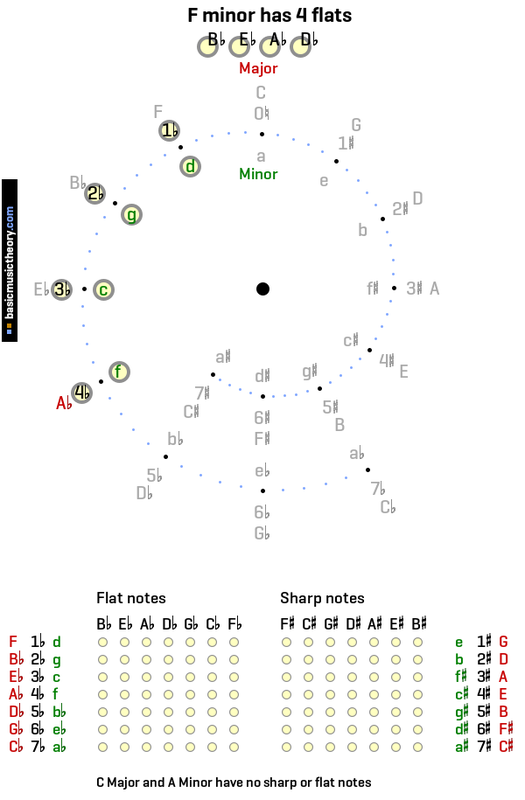 This step shows the musical relationships between the A-flat minor scale and C-flat major scale on the Circle of 5ths diagram. Now we have moved counter-clockwise to the Ab natural minor scale, which has 7 flats - every note is flattened. Looking across from the green minor scale label to the red major scale label, the relative major of this scale is Cb major scale. Having already drawn in the relative major - Cb major on circle of 5ths, which has the same note names, we know that the extra flat needed for this step is Fb. From the table below, we can see that the 3rd note in this scale, note Cb, so the relative major of this scale is Cb major scale, which matches the red major note label. 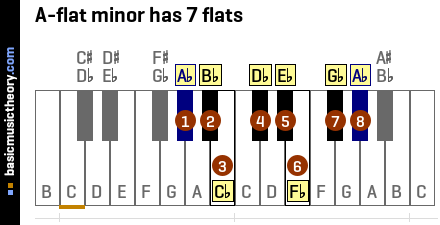 The 6th note in the Cb major scale is note Ab, which is relative to this minor scale - Ab natural minor scale, and the table below also shows us that these relative scales contain the same note names. The treble clef for this scale shown above has has 7 flats, which is the same key signature as the relative major we saw in the previous lesson - Cb major on circle of 5ths. We have now completed the entire Circle of fifths diagram, and by memorizing a single phrase and a few facts, we have worked out the key signature of every scale on the diagram, so now we know every single note on every scale.